A tornado touched down Monday night in Seward and Meade County. 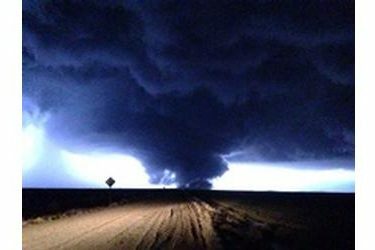 A tornado was reported two miles southeast of Kismet at 6:30. Damage was reported to at least one residence, a hog farm, and power lines were reported from the tornado which pass through the area. Sirens sounded in Liberal as a tornado formed just north and east of the city. A large tornado first spotted in Seward County made its way into Meade County, causing the power outages north and east of Liberal and the damage to homes in Kismet. A family was trapped in the basement of the destroyed home and had to be rescued. The hog barn was completly destroyed and a huge generator was toppled over. The tornado measured about one quarter of a mile wide. The tornado made its way four miles east of Montezuma where damage to a barn was reported at 6:45.